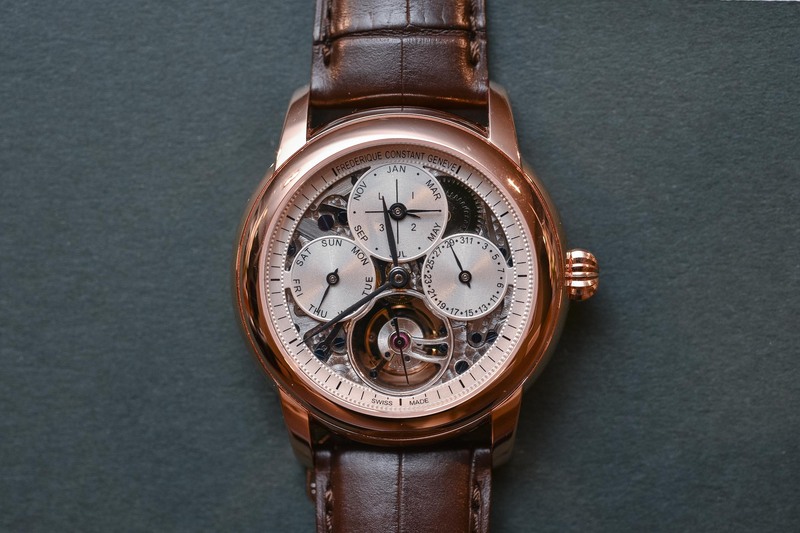 The brand advocating “accessible luxury” does it again with a double complication in steel for under EUR 20,000. 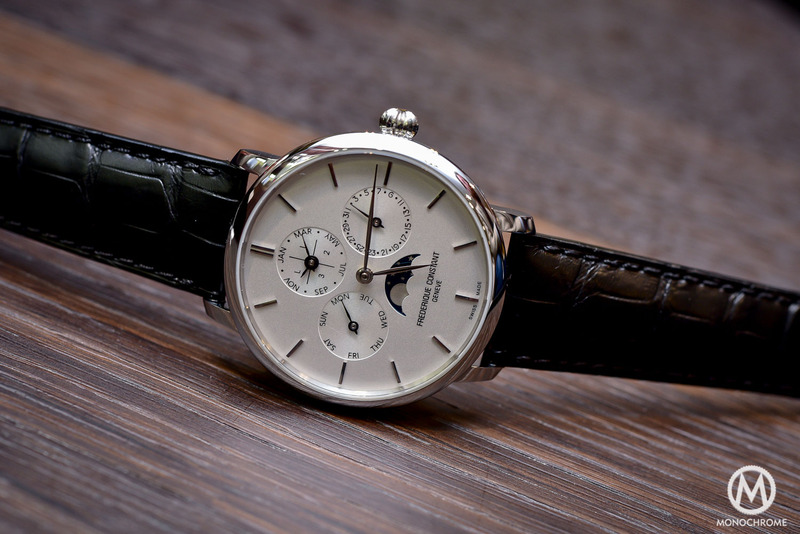 Celebrating its 30th anniversary, Frederique Constant wowed the crowds in Paris with its double complication at an unbelievable price. 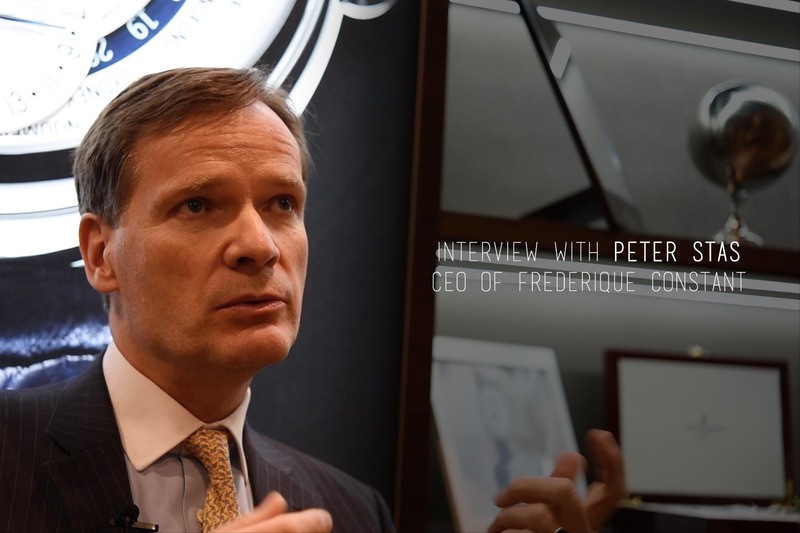 Once again, Frederique Constant sticks to its slogan of ‘accessible luxury’ and proves that acquiring a quality, manufacture watch with complications does not mean having to mortgage your house. 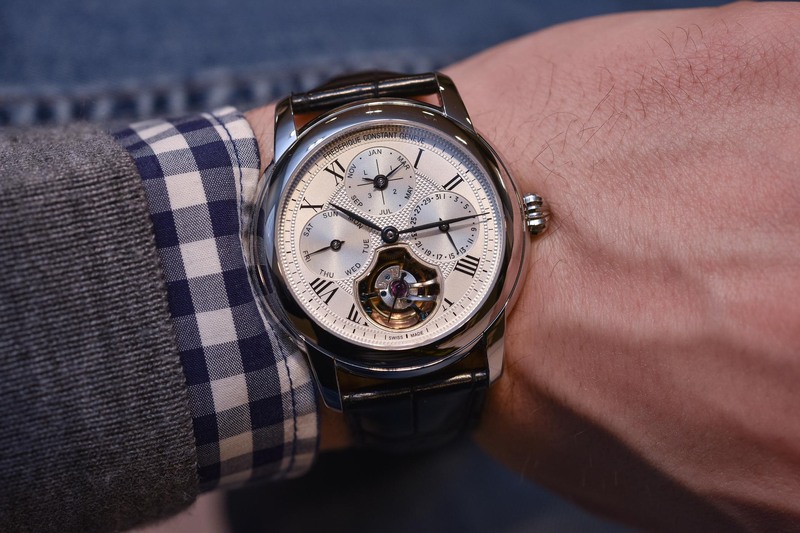 Frederique’s Constant QP Tourbillon Manufacture snubs the tradition of hyper-expensive complications and offers its very own, in-house take on this classic complication for an exorbitantly contained price. 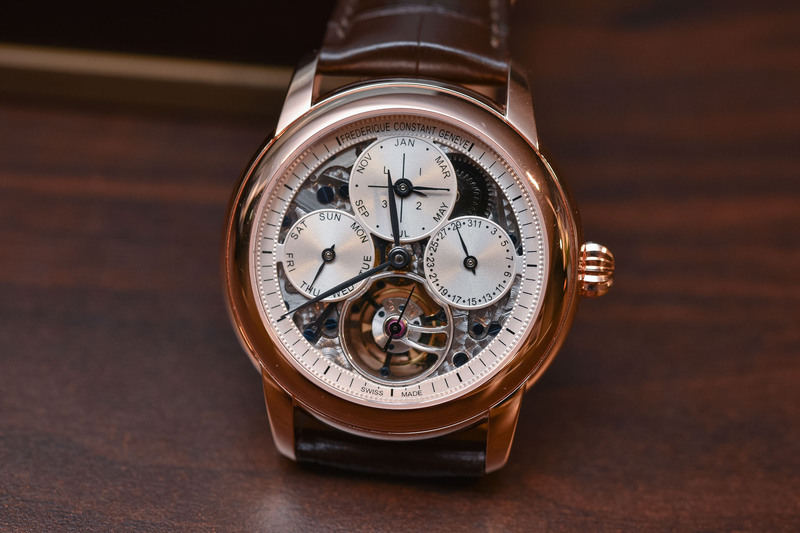 As the culmination and showcase of all the technology FC has amassed over the years, the Perpetual Calendar Tourbillon is equipped with the new automatic FC-975 in-house movement. Presented in three different metals and with an openworked or closed dial, the one everybody will be zoning in on is the stainless steel contender with an unbeatable price tag of EUR 19,495. Peter and Aletta Stas founded FC in 1988 and to date have 27 calibres under their belt – quite a feat! 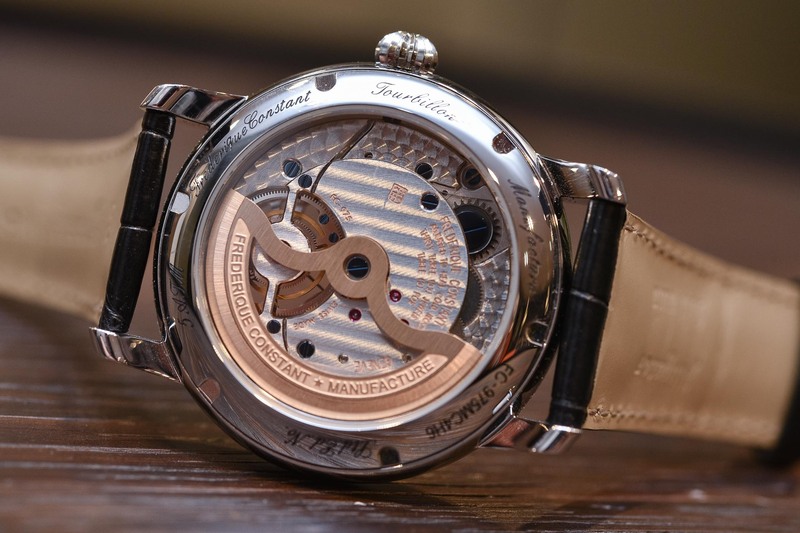 The game changer for the couple was the development of their first in-house movement. Unveiled in 2004, the Heart Beat Manufacture Movement revealed the palpitating heart or balance wheel through a cut-out on the dial – a signature display at FC. 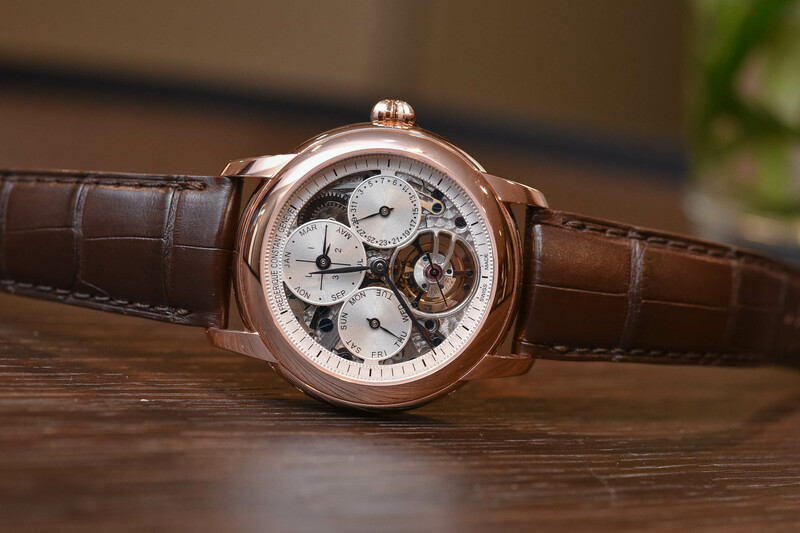 In 2008 the brand launched its first in-house tourbillon with a silicon escapement wheel, and by 2016, the brand upped the complexity ante and came out with an in-house perpetual calendar watch retailing for under EUR 8,000 – which knocked the socks off every other QP on the market (you can read all about how it compares to other perpetual calendars on the market in this article). In 2017 this technical feat was followed by a Flyback Chronograph retailing for EUR 3,990. Impressive, right? Four variations on the theme – closed dial in a steel case, closed dial in a rose gold-plated case, openworked dial in 18k rose gold and openworked dial in steel – comprise the line-up and are all limited editions. The three-part case measuring 42mm features a wide, stepped bezel and a prominent onion crown, and is identical to the case we recently saw on the Classic Worldtimer Manufacture. If 42mm sounds large, maybe it’s time to think again. Big is back; at least according to the FHH Journal and its trend forecasting article. Polished to a high gleam, the corpulent case is very much a part of the personality of this watch. 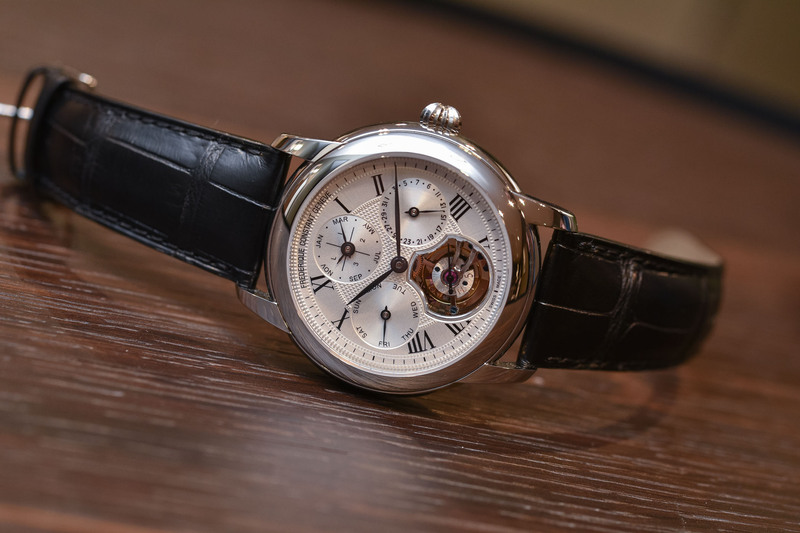 The ‘closed dials’ are silver in colour and display Frederique Constant’s classic bent and feature large printed Roman numerals, a clous de Paris guilloché decoration in the centre of the dial and the perpetual calendar indications arranged in three subsidiary counters with a snailed background. Months and leap year indicator are at 12, date at 3 and day of the week at 9 o’clock. In pride of place, the tourbillon cage is housed in a large aperture at 6 o’clock revealing its blued screws and silicium escapement and a black polished hand for the small seconds. The openworked dials are far more contemporary in spirit. Although you can see where the three sub-dials are attached to the minutes track and to one another, the effect is still more dramatic than the closed dial, allowing a view of the base plate with its circular graining and blued screws. With a permanent mission of cost-containment, one might wonder if any shortcuts have been taken below deck and whether the finishes are on a par with the importance of the complications. 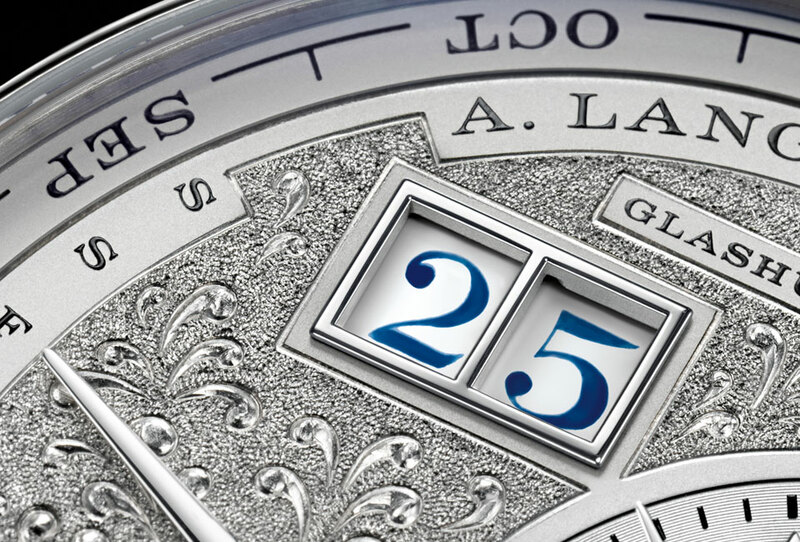 Admittedly, we are not looking at the refined hand-finishes of elite brands, but the decoration is correct with circular graining and Geneva waves. With 188 components animating the functions, the brand knew that it couldn’t cut corners with cheaper components and instead relied on state-of-the-art technology to achieve its end. With its advanced degree of vertical integration, FC was able to industrialise/mechanise the entire production of the tourbillon. The cage, made from 80 minuscule components with a precision of 1-2 micron, was made by CNC machine and swiftly patented by FC. Fitted with a silicium escapement wheel and anchor, which ensure good friction properties (no oil needed), the material is light, durable, anti-magnetic and resistant to temperature changes contributing to greater reliability and an increase of chronometric results over time. A nice touch is that each tourbillon cage is numbered on the top plate to match the limited edition number on the case. The perpetual calendar module, launched in 2016 is a basic perpetual calendar, but capable of performing all the tricks: taking into account the month of February during normal years (with 28 days) and during leap years (with 29 days), as well as providing the day, date, month and even leap years. Adjustments are done via pushers in the casebands and, according to the brand, the perpetual calendar complication won’t need any manual correction for 400 years. The Automatic Calibre FC-975 beats at a frequency of 28,800 alt/h and has a power reserve of 38 hours – slightly on the short side for a watch you don’t want to see run out of gas. No doubt that is why there is a watch winder box in the press kit pictures. Altogether the QP Tourbillon Manufacture is a very impressive product at a price we are not used to seeing in this category. At this rate, accumulating complication after complication, what’s next at FC? A minute repeater, perhaps? The 18k rose gold QP Tourbillon Manufacture with an openworked dial and a brown alligator strap retails for EUR 29,995 and is a limited edition of 30 watches. The stainless steel model with an openworked dial comes on a black alligator strap, retails for EUR 20,995 and is limited to 88 pieces. 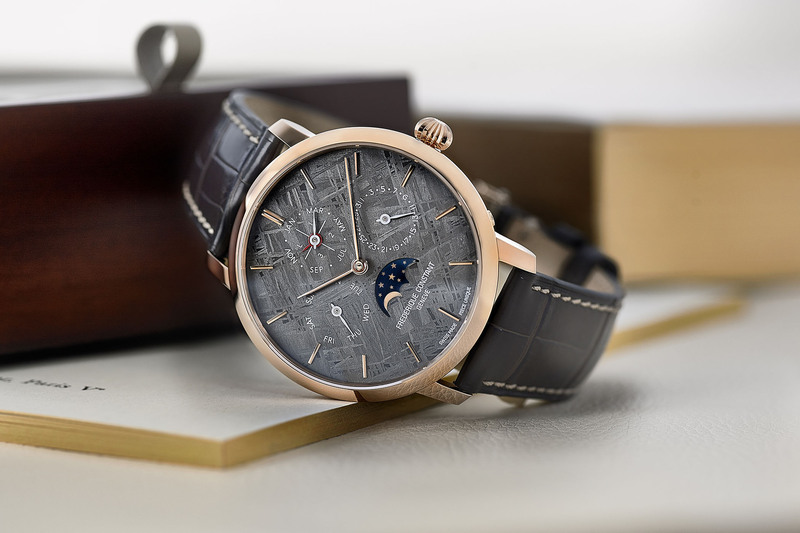 The closed dial model in steel on a black alligator strap retails for EUR 19,495 while the rose gold-plated version on a brown alligator strap retails for EUR 19,995, both models are limited editions of 88 pieces each. 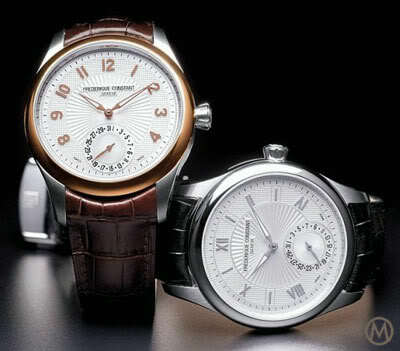 For more information, please visit www.frederiqueconstant.com. And more at Breguet, Blancpain, A. Lange & Söhne or Patek Philippe, all north of EUR 150,000. 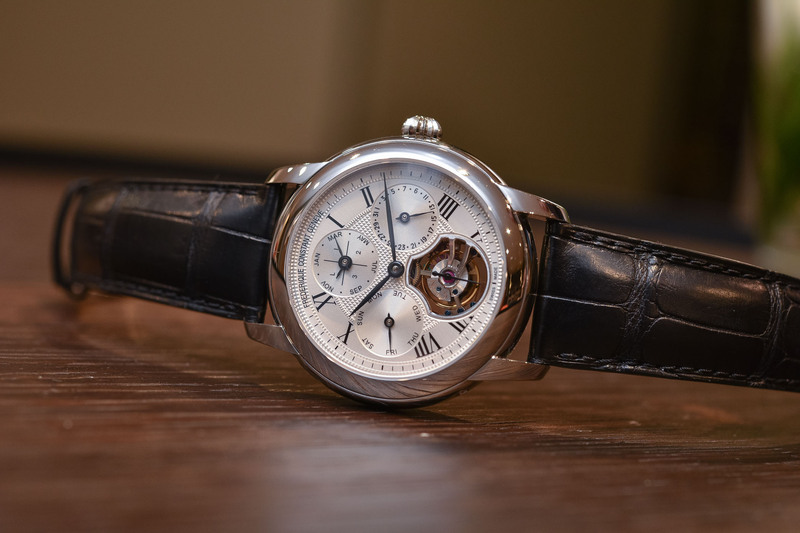 With its Perpetual Calendar Tourbillon Manufacture, Frederique Constant has created its own (niche) market: the accessible haute-complication. 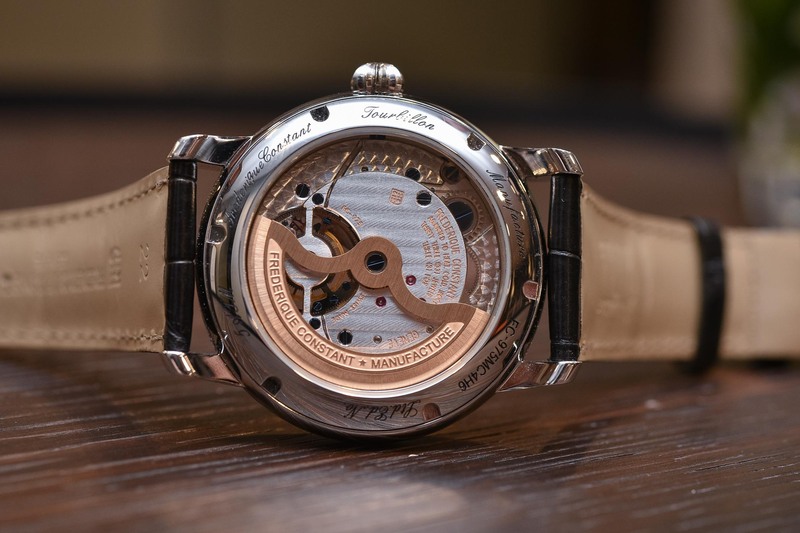 Certainly, it has nothing to do with the aforementioned watches in terms of technical solutions, decoration and prestige, but still, it offers the same functions. Incredible value. Shame about the power reserve, but that’s only a small issue. 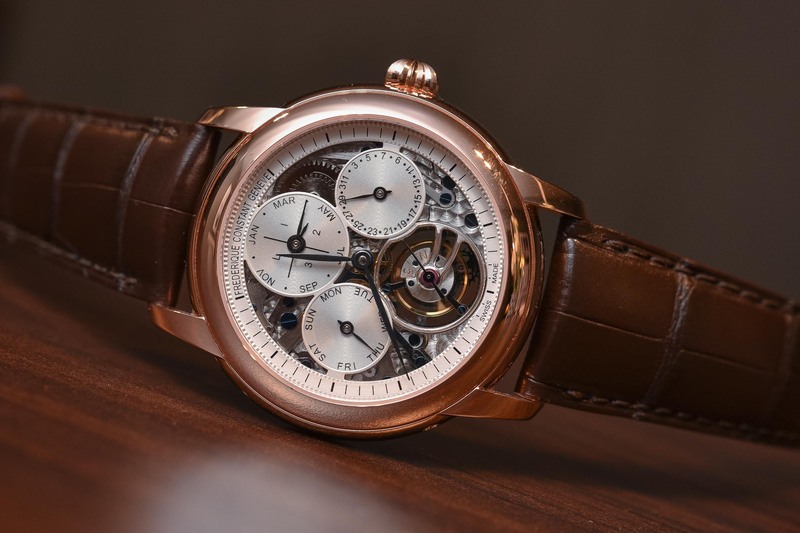 I think this watch may shift the dynamics of the industry, and give some concern to the elite brands that have known for many years that the tourbillon “complication” was overpriced. 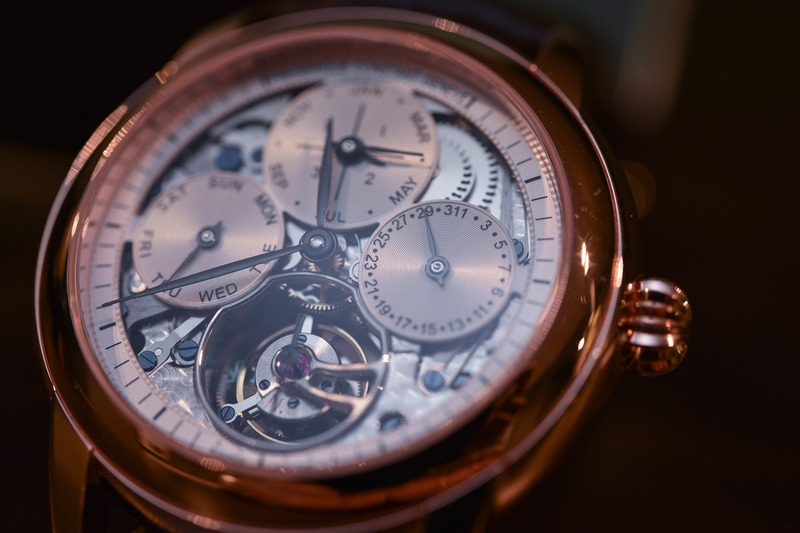 The PC however is truly a grail complication and this new calibre is indeed groundbreaking. I love this watch in spite of its size and while I am still dubious about the overall value of todays tourbillon craze, there is no denying its value here. These are clearly well made pieces, the SS closed version shines brightest for me. I might even be seduced into the openworked version, as it presents relatively dignified, in spite of its novelty. 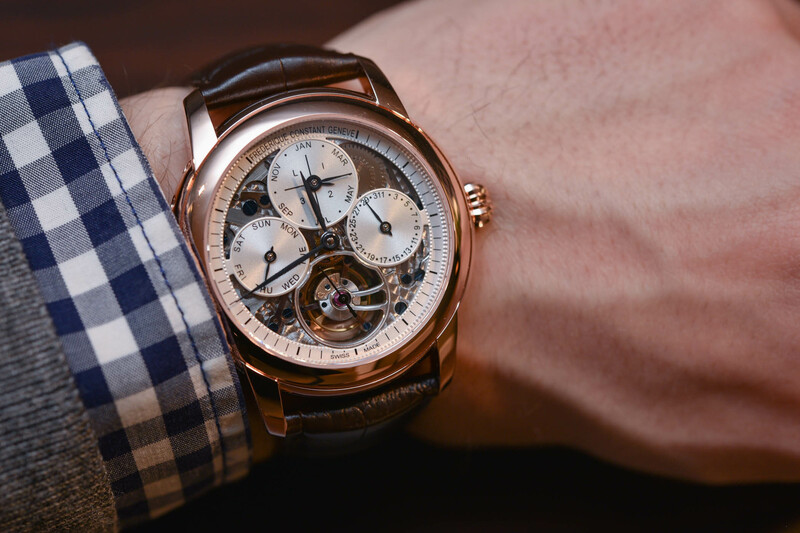 I hate tourbillons and I hate perpetual calendars but I am very happy for FC. It is a brand which deserves to succeed.